In a medium sized pot bring water to a boil and add ginger and garlic. Let simmer for a few minutes to incorporate flavours. Add noodles and let cook one minute. Take off the heat. In a small bowl, whisk miso paste with a little of the stock until it’s smooth. Add back into the pot. While the stock is simmering, prepare all your veggies and arrange them in bowls. Pour the stock over top and garnish with avocado and lime juice. Makes two servings. Yum! I love miso soup, and try to always have a tub of miso in the fridge so I can whip it up whenever I want. But avocado in the soup? Oh wow, that’s a texture direction I hadn’t considered. I’ll give it a go and report back! 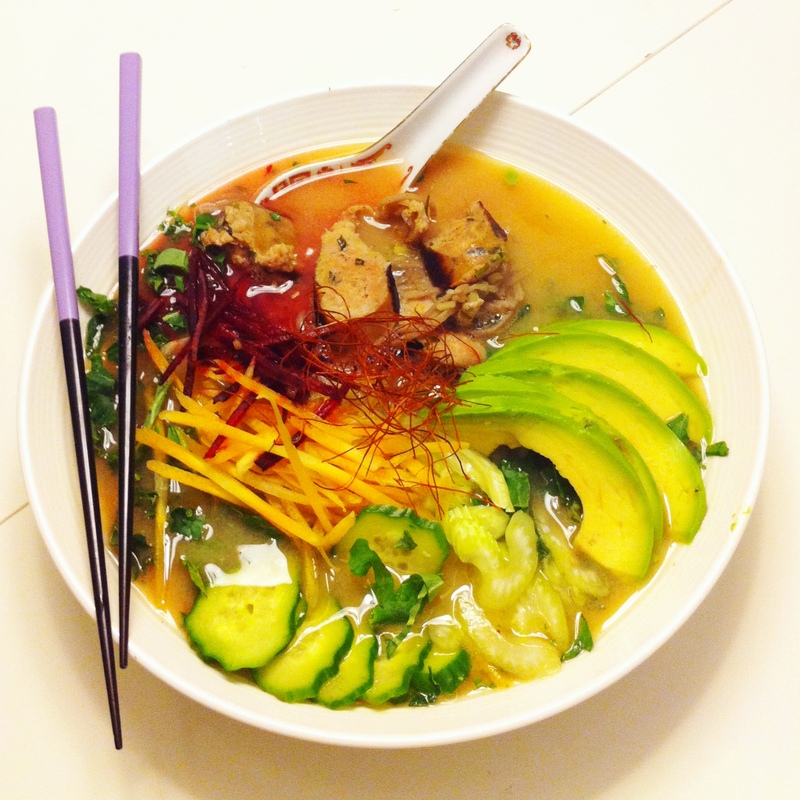 nothing better than extra-garlicky miso soup on a cold day – I made a version of this tonight! sans noodles/chicken, and with sweet peppers, green beans, mushrooms, and kimchi. i also may have overboiled. next time i will add soba noodles and be more gentle with the miso.